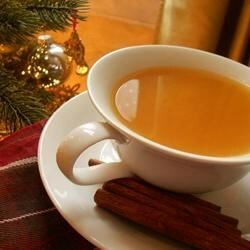 "A quick and delicious hot cider drink - Great for cold weather entertaining. Always a big hit with young and old! Cloves can be placed into cheesecloth or teabag infuser for easy removal if desired. A cinnamon stick in each cup makes a nice garnish." In a large stock pot over medium heat, combine the apple cider, orange juice, pineapple juice, cinnamon sticks, cloves and honey. Bring to a boil, then simmer over low heat, or transfer to a slow cooker to keep warm while serving. Strain out cinnamon sticks and cloves before serving if desired. Nothing beats back a chilly day better than a steaming mug of spiced apple cider. So good! Stuck it in a crock pot on high an hour before my party started and was perfect and ready for serving when guests arrived. They loved it! This is a fabulous recipe! Even my sister, who isn't very fond of wassail, enjoyed this recipe. And it's just as delicious cold, and with a touch of lemon-lime soda.